Definition at line 780 of file open.c. Definition at line 444 of file open.c. Definition at line 929 of file open.c. Definition at line 169 of file open.c. Definition at line 179 of file open.c. Referenced by cancel_open(), and handle_close(). Definition at line 34 of file open.c. Definition at line 470 of file open.c. Definition at line 849 of file open.c. Definition at line 189 of file open.c. Referenced by messages< char >::open(), messages< wchar_t >::open(), and open_or_delegate(). Definition at line 868 of file open.c. Definition at line 480 of file open.c. Definition at line 401 of file open.c. Definition at line 352 of file open.c. Definition at line 743 of file open.c. Definition at line 104 of file open.c. Referenced by cancel_open(), cleanup_close(), delegation_return(), handle_open(), and upcall_cleanup(). Definition at line 96 of file open.c. 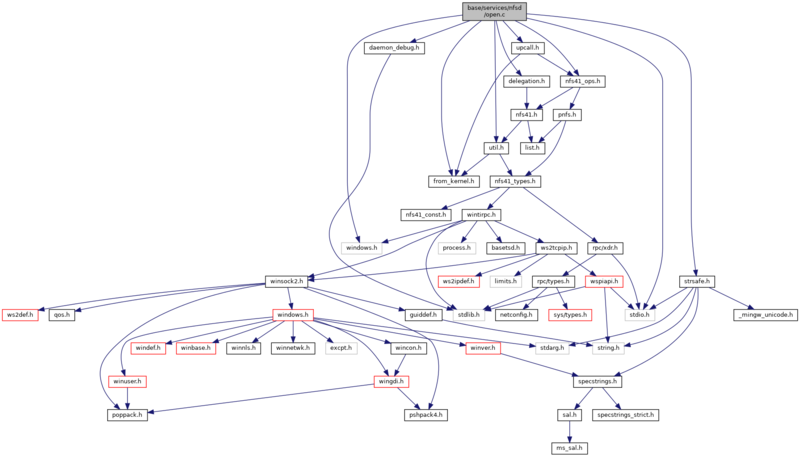 Referenced by deleg_open_find(), handle_open(), and upcall_parse(). Definition at line 125 of file open.c. Definition at line 320 of file open.c. Definition at line 232 of file open.c. Definition at line 79 of file open.c. Definition at line 259 of file open.c. Definition at line 826 of file open.c. Definition at line 277 of file open.c.